"Radmuttern, 1/2″ rechts konisch chrom geschlossenes Ende"
Lug Nut Thread Size: 1/2-20 RH in. 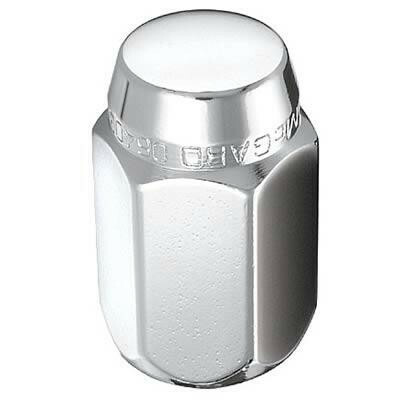 Lug Nut Overall Length (in): 1.500 in. Wrench Size Required (in): 13/16 in. McGard lug nuts are designed to last for life. They're triple nickel chrome plated for lasting beauty and are made of restricted chemistry steel for structural integrity. All McGard lug nuts are through-hardened and tempered, reaching the depth of hardness needed for their unsurpassed level of safety (unlike case-hardening, which is only a surface treatment). McGard lug nuts also offer a lifetime guarantee against rust! What more could you ask for?